FREDERICK, Md. 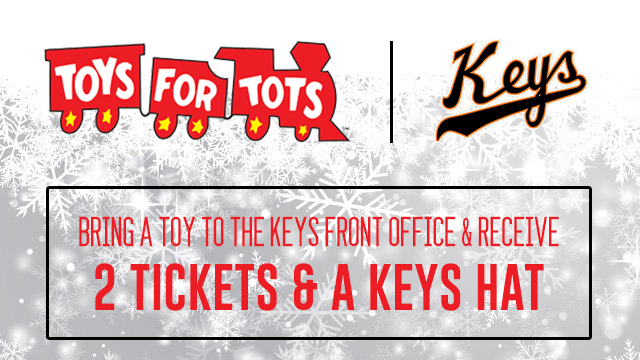 -With the holiday season right around the corner, the Frederick Keys are partnering with Toys for Tots. For the fifth straight year, the team will assist the U.S. Marine Corps Reserve Toys for Tots program by collecting new, unwrapped toys in November and December. These gifts are then given as Christmas presents to underprivileged children. Nymeo Field collections begin on Tuesday, November 1. Fans who wish to make a donation can drop off toys from 9-5p.m Monday through Friday in the main office. Anyone who participates will receive a Keys hat and two tickets to a 2017 home game. "Each year it's amazing to watch how many members of the community come by the stadium to drop off toys for less fortunate kids," said Keys Director of Marketing Bridget McCabe. "Since we started collecting, donations have been through the roof and we're excited to continue that trend this holiday season." Over the last few years, Nymeo Field has been among the top Toys for Tots collection destinations in Frederick County. Since being approved as an official activity of the Marine Corps in 1995, Toys for Tots has distributed over 512 million toys to more than 237 million less fortunate children. The Frederick Keys kickoff their 2017 season on Thursday, April 6 at Nymeo Field against the Carolina Mudcats. For ticket information and the latest offseason news, fans can call 301-815-9900 or visit frederickkeys.com.